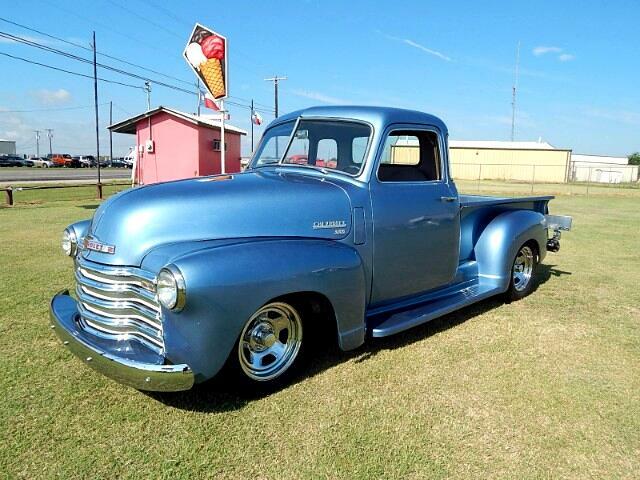 Lone Star Muscle Cars IS proud to present this one of a kind 1950 Chevrolet Five Window 3100 Truck. Powered by a fresh 350 motor and automatic transmission, Power Steering and four wheel power disc brakes Edelbrock Carb and so much more under the hood. On the interior you will see Power Leather drivers seat center leather sifter and door panels all tilt steering wheel retro sound system and so much more. On the out side you will notice a ton of specialty work performed from the drop bed to the show quality exterior Paint. All New Wheels and tires.With the low stance this truck sits on a normal suspension for a smooth ride and better handling. if you are looking for that cool 50's truck here it is. Message: Thought you might be interested in this 1950 Chevrolet Trucks Pickup.